Woropay, Olexa [Олекса Воропай], pen name Oleksa Stepovyi – ethnographer, writer, naturalist; born on 9 November 1913 in Odesa (Ukraine; at that time – Kherson gubernia, Russian Empire); died on 20 July 1989 in Leeds, England, United Kingdom; buried in Wetherby. In 1928-1933 Woropay attended an agricultural college in the village of Erdelivka in the Odesa oblast (now the village of Haivka, Kirovohrad oblast). He then worked as a district agronomist in the Vinnytsia oblast, where he witnessed the 1932-33 famine (Holodomor) and its consequences (which he later described in his memoir The Ninth Circle). 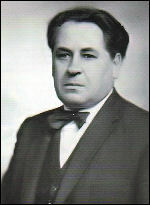 For a short time in 1935 he attended an agricultural institute in Uman, from which he was expelled for political reasons. He subsequently moved to Russia and was able to enrol in the Moscow agricultural academy, from which he graduated in 1940 with a degree in agricultural science. Later that year he began a correspondence course at Odesa university, studying ethnography and folklore. For a time he worked as an agronomist in Voznesensk (Mykolaiv oblast). After the German invasion of the USSR in June 1941 he relocated to the Northern Caucasus. In the autumn of 1942 he returned to Ukraine and settled in the village of Voronovytsi in the Vinnytsia oblast. In 1944, together with his wife, he made his way to the West and reached Germany, where he lived in various displaced persons camps. At the beginning of 1946, in the Somme Kaserne camp in Augsburg, he resumed his studies in ethnography and folklore at the camp-based branch of the Ukrainian Free University (UFU) which had resumed activities in Munich. At the beginning of March 1948 he came to the United Kingdom and, initially, worked in a factory in Oldham. In November 1949 he moved to London where, from December 1949 to April 1951, he was employed as a railway worker. From October 1951 to March 1952 he taught Russian at a British military language school. From October 1953 to August 1954 he was the editor of the Ukrainska Dumka newspaper, and from September 1954 to September 1955 he edited the Za Yednist Natsii monthly. He continued his studies and in 1957 defended his dissertation in Slavonic ethnology, gaining a doctorate from the UFU. In 1961 he gained a second doctorate from the UFU, in plant biology. In August 1960 he began to work for the Lending Library Unit of the government Department of Scientific and Industrial Research. In September 1961, in the course of the transfer of the unit to Boston Spa (where it became the National Lending Library for Science and Technology, now part of the British Library Document Supply Centre), he moved to Wetherby, near Leeds. He continued to work at the Library until his retirement in December 1978. Woropay was a reader (docent) in the ethnography department of the UFU, as well as head of the ethnography sections of the Ukrainian Free Academy of Sciences and the Ukrainian Mohyla and Mazepa Academy of Sciences. He was also a member of the Institute of Biology, the Botanical Society of the British Isles, the Royal Anthropological Institute of Great Britain and Ireland, and the International PEN Club Centre for Writers in Exile. In 1959-60 he was a member of the Governing Council of the Association of Ukrainians in Great Britain, and for many years served on the financial oversight committee of the Society of Ukrainian Litterateurs in Great Britain. He was the author of many works on ethnography and folklore, as well as reminiscences, including: Vohni v tserkvi: suchasni ukrainski narodni lehendy (Lights in the church: modern Ukrainian folk legends; Augsburg, 1946), Yasyr (Tatar Captivity; Augsburg, 1947) – describing the life of Ukrainian forced labourers in Germany, Ukrainski narodni prypovidky (Ukrainian folk proverbs; London, 1952), Pryhody Marka Chubatoho (The Adventures of Marko Chubatyi, novella; London, 1954), Ukrainski narodni zahadky (Ukrainian folk riddles; London, 1954), V deviatim kruzi … (In the Ninth Circle …; London, 1953), The Ninth Circle: Scenes from the Hunger Tragedy of Ukraine in 1933 (London, 1954), The Ninth Circle: In Commemoration of the Victims of the Famine of 1933 (Cambridge, Mass., 1983), Zvychai nashoho narodu (The folk customs of our people, two vols; Munich, 1958, 1966). Some of his works have also been republished in Ukraine, particularly Zvychai nashoho narodu (approximately 10 editions between 1991 and 2013).